“The Man Who Saved the World” is the gripping true story of a lieutenant colonel of the Soviet Air Defense Forces, Stanislav Petrov, who refused to order the launch of nuclear weapons when the warning system showed — erroneously — incoming U.S.missiles. The Danish-made film, directed by Peter Anthony, is half-documentary and half-reconstruction.It was released in October 2014 at the Woodstock Film Festival and since then, Anthony, who wrote and directed the movie, has been on the road bringing Stanislav Petrov’s story to audiences all around the world. Over time, however, changing politics and glasnost made it possible to piece together the story. And Petrov eventually agreed to share some of his memories. By then he was tired and embittered by his treatment after the incident. In the film, the documentary footage of Petrov’s last years, which were rather lonely and isolated, contrast with the reconstructed scenes of the young and active lieutenant colonel, played by Sergei Shnyryov. 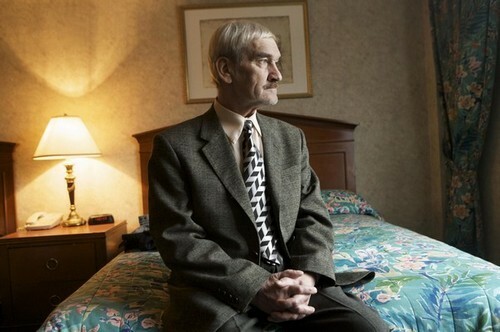 Stanislav Petrov was born in 1939 in the Soviet Far East. After joining the Soviet Air Defense Forces in the early 1970s, he was assigned to the organization that oversaw the new early warning system intended to detect ballistic missile attacks from NATO countries. In 1983 on the night of September 26 and 27, Petrov was the duty officer in the Serpukhov-15 command center. He got information from the Soviet warning satellite Oko system that five American nuclear missiles were heading toward the Soviet Union. Petrov believed that the satellite system was mistaken and that it was a false alarm. He ordered his colleagues not to act, de facto breaking protocols.His actions prevented an erroneous counter-attack against the USA and their allies in NATO, an act that could have set off a massive nuclear war. Although Petrov’s decision saved the world, he lost his reputation, his job and his wife. He retired from the military in 1984 and became a senior engineer at the research institute that had created the early warning system. A later investigation concluded that Soviet satellites had mistakenly identified sunlight reflecting on clouds as the engines of intercontinental ballistic missiles. The fictional part of the movie recreates the events of 1983 in a Soviet command center designed by an architect advised by Petrov. The documentary part of the movie shows Petrov on a trip to the U.S. where he was honored in a meeting at the United Nations in New York. It also shows his meetings with a number of American actors, such as Kevin Costner, Robert De Niro and Matt Damon, who all wanted to meet Petrov and thank him. “My decision was the only right one,” Petrov repeats in the film, insisting that he was simply doing his job. Petrov died in 2017, but Anthony continues to travel around the world with the film. The film will premiere at Moscow’s Documentary Film Center on Thurs. Feb 22 to mark Defender of the Fatherland Day. It will run at the Center and other Moscow theaters. See Listings for times and places.